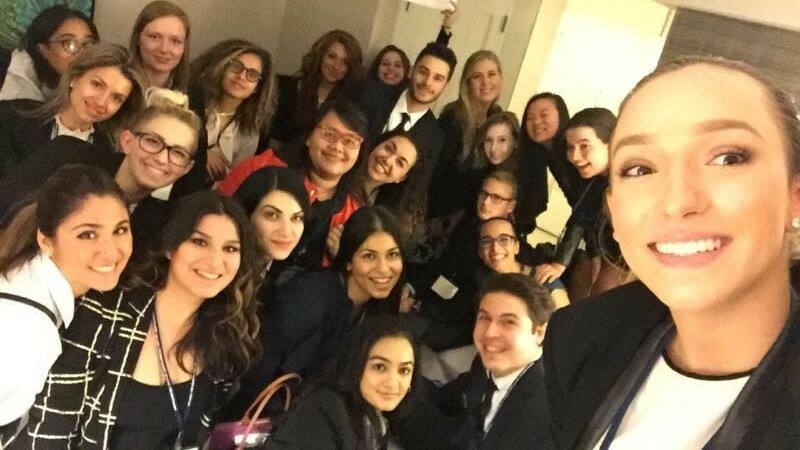 Danyelle Lepardo ’17 (foreground, right) with the Pace University New York City Model UN students at the 2016 National Model UN conference in Washington DC. The recent elections here in the United States have divided our country by party, race, ethnicity and many other fissures. Political polarization seems to separate us even more. Some say it’s a rough time to be living in America, with violence in our backyards and hateful words pouring out of us in the blink of an eye. It’s hard to find peace and unity within the American community right now. Model United Nations gives students the opportunity to research parts of the world that are unfamiliar to their own. It gives students the opportunity to adapt to different cultures and go outside of their comfort zone. Many of us played a role that was completely different from our daily lives. Many of us found ourselves portraying views we thought we could never have. Nonetheless, instead of judging delegates on the views they had, as I often found myself doing, I started to become more accepting and found myself trying to understand other delegates and their point of views, as they did for me. Model UN wasn’t made to separate delegates and marginalize them based on their views. Model UN draws on the UN Charter and the Universal Declaration of Human Rights to unify people. We came together to create the best resolutions possible, based on teamwork, hard work, and accepting one’s views to make the world a better place. This weekend gave me a chance to see the humanity in the international community, the love and admiration for peacemaking among students, and the solidarity in delegates, regardless of the polarized views they are supposed to uphold. I am so proud to be a part of a community where morals spread to the furthest ends of the world and shed light on what it means to be united, when the rest of the world seems to be falling apart. This entry was posted in Student Delegate Blogs and tagged Danyelle Lepardo, National Model UN, Washington. Bookmark the permalink.